Shade some cells, such that each area has four shaded cells, forming a tetromino (four orthogonally connected cells). 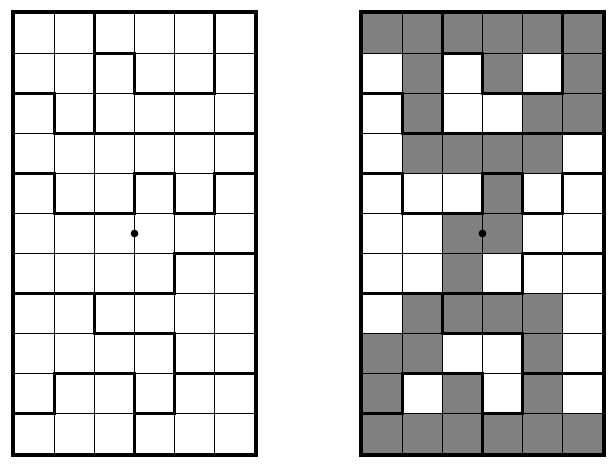 All shaded cells must be connected orthogonally, and there can’t be any 2-by-2 square consisting en- tirely of shaded cells. Furthermore, no two of the same type of tetromino touch along an edge. Here, “same” is up to rotation and reflection, the four types are the L, I, T and S tetrominos. The shaded cells must be pointwise symmetric around the center.